The U.S. Navy and naval forces from seven other NATO member countries have engaged in an integrated air and missile defense scenario Saturday as part of the Formidable Shield 2017 exercise. Warships from Canada, France, Germany, Italy, the Netherlands, Spain, UK and U.S. defended against a ballistic missile and three anti-ship cruise missiles during the live-fire IAMD test, the U.S. 6th Fleet said Saturday. The exercise brings together more than 14 ships, approximately 3,300 personnel and 10 aircraft platforms from the aforementioned countries, as well as Belgium, Denmark and France to participate in exercises on the U.K. defense ministry’s Hebrides Range in Scotland. The U.S. ships taking part in the event include Arleigh Burke-class guided-missile destroyers USS Donald Cook, USS Mitscher and USS Winston S. Churchill, as well as Louis and Clark-class dry cargo ship USNS Medger Evers. USS Donald Cook fired a Standard Missile-3 Block IB to intercept a medium-range ballistic missile target. At the same time, Spanish Frigate SPS Alvaro de Bazan launched an Evolved SeaSparrow Missile to defend against an anti-ship cruise missile, as Netherlands Frigate HNLMS Tromp also fired an ESSM towards anti-ship cruise missiles. 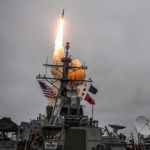 The Missile Defense Agency and Navy also test-fired a Standard Missile-6 from USS McFaul guided-missile destroyer as part of the missile technology’s flight certification process.